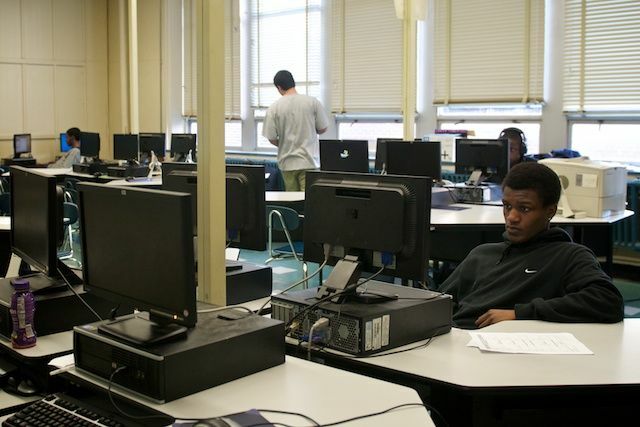 A Bridgeport student takes a Smarter Balanced practice test. Districts that achieve the federally required participation rate of 95 percent will receive a letter of commendation from the state education commissioner, and those that have participation rates between 90 and 95 percent will receive a letter reminding them they must raise their participation rate to meet the federal requirement. “This approach will ensure that districts meeting the standard are commended, those failing marginally are gently alerted, and those falling behind are strongly reminded of the potential consequences and provided support to remedy the situation,” Connecticut Education Commissioner Dianna Wentzell wrote in a letter to the federal government earlier this month. The letter was released Tuesday by the state education department. It was not clear how much money the state would withhold from sanctioned school districts. The state gives schools performance ratings on a number of quality measurements, and schools that fall far short of required exam participation rates will be given a lower rating. About 11,200 students did not take the state exams last school year — a growing trend referred to as the “opt-out movement.” It coincides with growing concern among parents that their children are spending too much school time being tested or prepared for tests. But education leaders counter that these exams are, among other things, an important civil rights vehicle, that identify whether minority and vulnerable populations are receiving the education they deserve. Wentzell said during a recent interview that she believes students should get some sort of sticker after they take their exam to highlight the importance of participation, just as citizens do on Election Day after they vote. This past spring, one-quarter of public school districts throughout Connecticut did not test at least 95 percent of their students. School districts will begin facing the state sanctions based on whether too few students take the exams next spring. School district leaders will be notified by Jan. 15 of the potential consequences they face, and districts where fewer than 90 percent of students participated last school year will be required to submit plans to the State Department of Education by mid-February outlining how they plan to address the problem in the upcoming testing cycle. 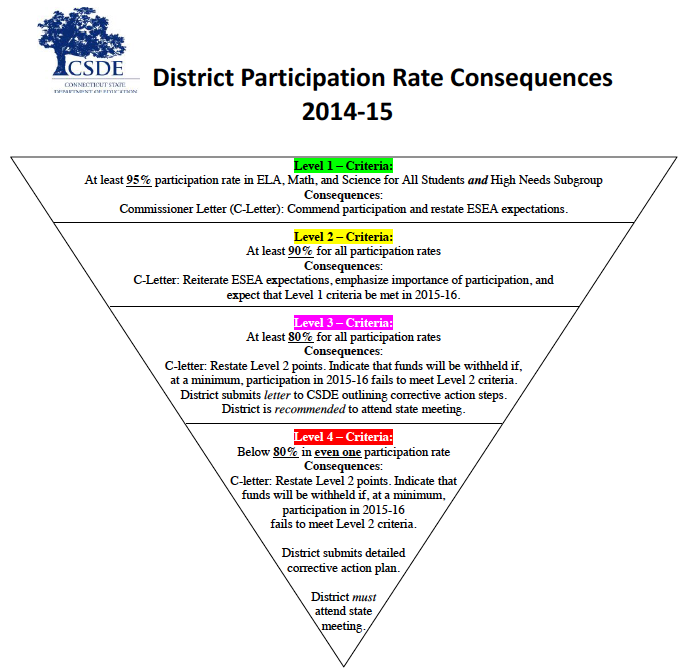 The state will offer a conference in February to help districts improve participation. Twenty-two school districts tested fewer than 90 percent of all students last school year. The participation rate of 90 is also required among a number of student subgroups, such as minorities, students whose primary language is not English and children in the foster care system. It was not immediately clear how many districts fell below the 90 percent participation rate for any group of students. Connecticut lawmakers earlier this year voted to replace the Smarter Balanced Assessment for high school students with the SAT, an exam many students take regardless. Aimed at removing one of the many tests high school students must take, Wentzell is confident this will fix the problem of so many students skipping the test. Changes to federal education policy signed into law earlier this month by President Barack Obama did not alter the requirement that 95 percent of students participate in testing. “While we are still digging through the components of the new law, it is clear that the ESSA requires that states administer statewide assessments in reading/language arts and mathematics in grades 3-8 and at least once in high school, and it requires that states build into their accountability systems ways to hold schools and districts that miss the 95 percent participation rate target accountable,” a spokeswoman for the U.S. Department of Education wrote in an emailed statement. The department has informed officials in 13 states so far that too many students missed the exam last spring and the states must come up with plans to ensure every student is tested. Although it is clear in the new federal education law that goes into effect next October that the U.S. Department of Education can require states to submit a plan to improve test participation, it has not been determined whether the federal government has the power to order changes to the plan. A spokeswoman for the state education department said her agency is awaiting approval of its plan from the federal agency.